Systems of planets and stars influence each other’s every movement; anyone on Earth needs to only look outside to remind themselves of that. But how do these bodies influence each other over long periods of time? The authors of today’s paper attempt to answer this broad question as it pertains to WASP 12. WASP 12 is a main sequence F star. 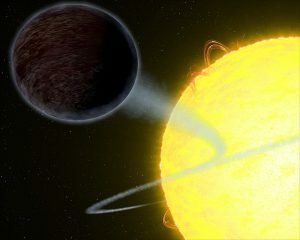 In 2008, the hot Jupiter WASP-12b was first discovered. Since then, research groups have found that this planet’s orbital period appears to be changing. 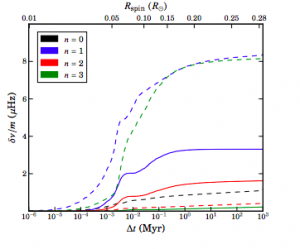 The authors have modeled the main star using MESA Code to track its evolution, and look at the system as a whole, while seeking to find why this planet’s orbital period is changing. Today’s paper thoroughly explore many possibilities, I have chosen to only go through a few in detail below. A possibility for the apparent change in the orbit of WASP 12b could be due to other companions. WASP 12 has a pair of M star companions, which are at a projected separation of about an arcsecond. Using the estimated mass for this pair of companions, and accounting for possible larger unseen planets, the authors state that this acceleration from companions is still about an order of magnitude too small to explain the orbital period change. The authors explore the companions in the context of equilibrium tides and Kozai-Lidov effects. Accounting for the companion stars in this context still does not yield a value for the orbital change that accounts for the observed change. WASP 12 has a small surface rotation, but the authors note that a small part of the stellar core should be spun up from angular momentum. They then use dynamical tidal effects to calculate the synchronous rotation rate. The frequency splittings calculated are shown below in Figure 2. Figure 2: This image shows rotational splittings plotted against the tidal torque for several orders of n. Figure 4 in paper. After calculating the rotational effects, the authors find that this would still be several orders of magnitude smaller than the observed effects. In a multiple-body system, the differential tide forces can lose energy to heat over time. This dissipation of energy affects the system evolution. The change in the period observed in the transits of WASP-12b cannot easily be explained by orbital decay alone, and the rate of standard tidal dissipation is too slow. However, dynamical tide mechanisms, which include tidal dissipation, give a comparable result to the observed transits. The authors considered several other possibilities for the cause of the orbital decay, but by eliminating other possibilities, the authors reach the conclusion that the orbit is likely decaying because of tidal dissipation within the star. However, the level of tidal dissipation indicates that the star would need to have evolved onto the subgiant branch, which is in contrast with the observations that the star is on the main sequence. The authors also postulate that the star may have a rapidly rotating core that remained convective, which could also explain the tidal dissipation. However, this explanation still leaves the question of why it had such a rapidly rotating core to start with, and does not explain the short decay timescale. The authors say that they have not found a model that accounts for all observations of the system and the orbital decay of the planet. However, it is clear from their work that the lifetime of both WASP 12 and WASP 12b are intrinsically tide together. By learning more about the nature of this system, we can learn more about the interactions between planets and stars over the course of their evolution.